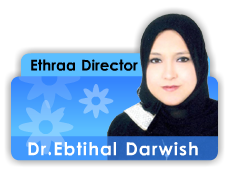 Dr. Ebtihal Darwish, the owner of Ethraa, a UAE local expert in health care management and training of health-related topics. · DOHMS Leadership development program, Harvard School of Public Health. She occupied many administrative positions including, head of Al Mamzar Health Center, Medical Director, and Professional Development Department Director in Primary Health Care Services Sector (PHCSS), Dubai Health Authority (DHA). Currently, she is working as a consultant Family Physician. She is also an Associate Professor in Dubai Medical College - Family Medicine Department. She has been participating effectively in the development of human resources in UAE at different levels, some of which include: undergraduate, postgraduate and continuous professional development level. She has a special interest and experience in research and evidence-based medicine and she has several publications.